I'm sure it is not lost upon everyone that the ol' skool diner/family restaurant is a dying breed. And no, I'm not referring to those hipster diners and/or "pretend" diners either. I'm talking about those that have been around for a long time and continue to serve up the same ol' skool items as they did before. Oh, and let's not even have any of the post-modern decor that adorns some new "diners" popping up all-over-the-place. Hey, I like those places too, but they don't have a history. One joint that has been around for as long as I can remember (since 1974) is The Slocan (formerly Slocan Family Restaurant) located at, well, Slocan and Hastings. Mil house, Kaiser Soze and I ended up here on a Sunday afternoon after hockey. It wasn't planned though. Consider it a backup plan of sorts. You see, we tried to visit Sushiholic (for the 3rd time, it closes too early and it's not open on Sundays!) 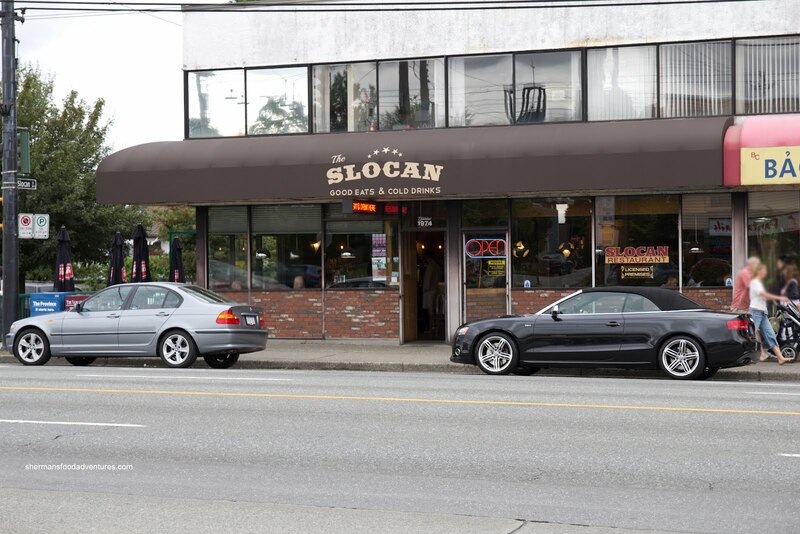 and since it was closed, Slocan was a close enough option. We were seated among families, young people and seniors, which really spoke to the broad appeal of the place. 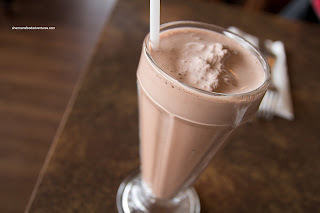 Milhouse wanted to make up for all the calories he burned at hockey by starting off with a Chocolate Shake. It is pretty obvious from the picture that the shake was not that thick. In fact, it was quite milky and weak in flavour. There was a definite lack of hard ice cream. This was a pretty average shake. 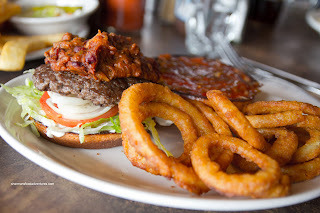 He followed up the shake with a healthy Chili Burger with onion rings (and he wonders why he is not losing any weight...). The burger patty was moist while the chili was a little bland. He liked the brioche bun (everyone is doing brioche these days!) and overall, it was a decent burger. The onion rings were very crispy, but due to pers onal tastes, we would've liked to see the breaded type instead. For myself, I went for the Rueben which came with a soup to start. 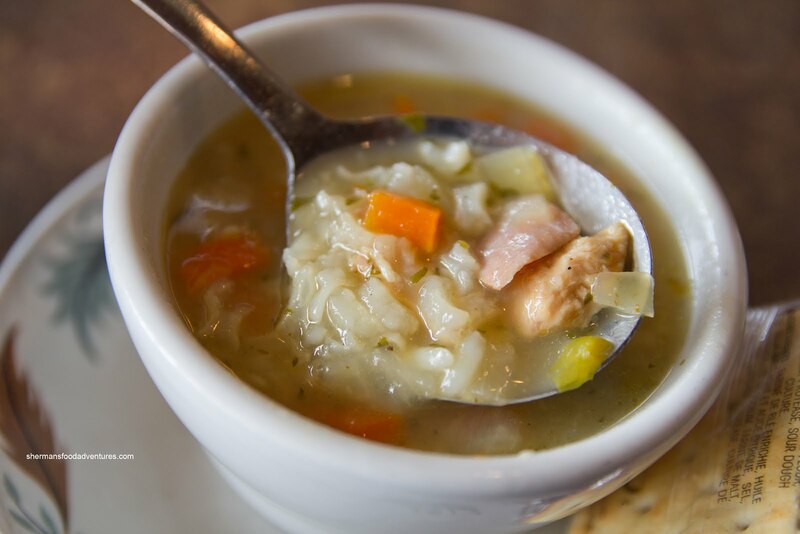 The soup of the day happened to be Chicken Rice. It was chock full of stuff including tender pieces of meat. The soup was hot (unlike many found at other places) and just plain tasted good. The flavours were balanced and had a home-made quality to it. Generally, a sandwich is a sandwich, unless there are interesting ingredients or it is prepared with care. My Rueben was neatly constructed and evenly grilled on both sides. 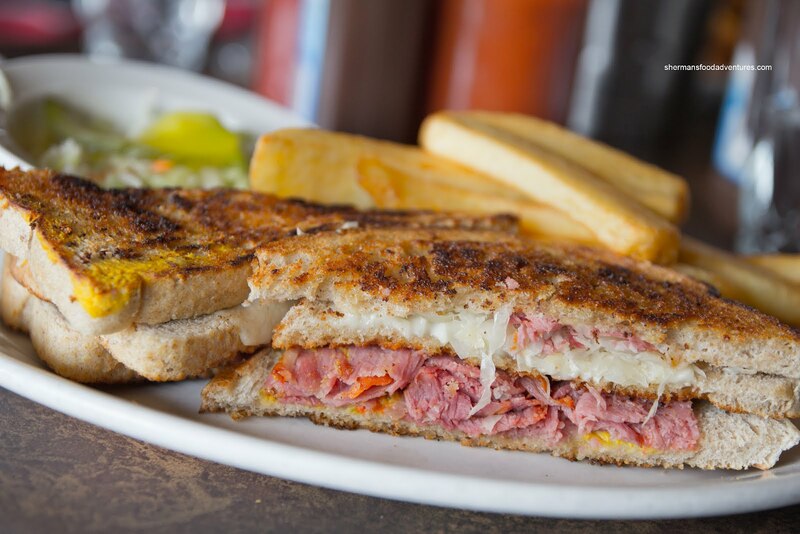 The result was crispy, buttery toast with sauerkraut, mustard, Swiss and corned beef in between. The steak fries were a blast from the past too. They were naturally starchy and only slightly crisp. Kaiser Soze opted for breakfast and went for Hotcake Platter with 2 hot cakes, eggs and bacon. I was able to sample the hot cake while Kaiser Soze wasn't looking (actually he let me try it to my surprise!). It was super fluffy and tasted great on its own. 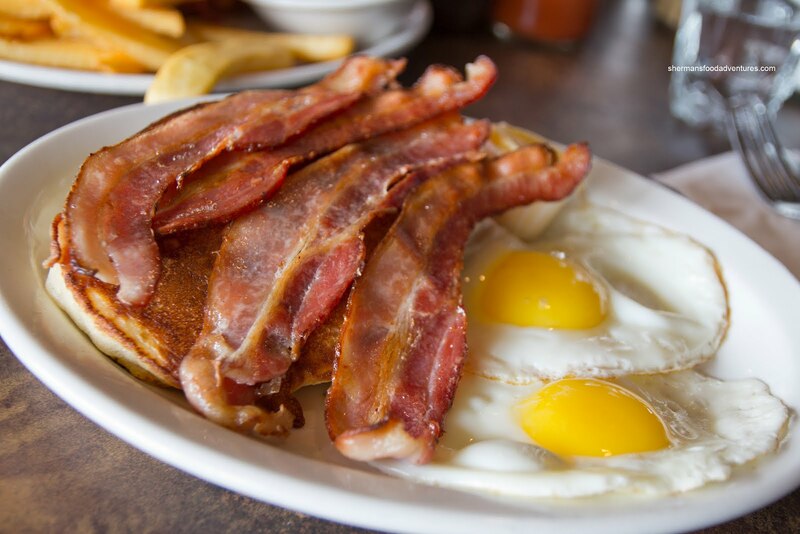 The eggs were perfectly sunny side up while the bacon was thick-cut, meaty and crispy. I've haven't seen a plate of breakfast items so carefully prepared and plated in quite some time. And that is probably why Slocan continues to survive all these years. Their commitment to serving well-prepared food at reasonable prices (not to mention good portions), keep people coming back. Hey, we'll probably be back! I noticed the name "adjustment" a few days ago. Pretty sure I went there a few times when I lived in North Burnaby, and always wanted to return. Did they install a hot tub sized deep fryer that could fit a buffalo with the name change? @Hungry LOL... I would like to see it if they did!